Depending on any colour scheme that you have for your wedding, some invitations are going to be more attractive and appealing than others. If the happy couple have gone to the trouble of implementing a colour scheme and theme for the big day, it makes sense to introduce these colours and this style as best as you can across everything related to the wedding. You want to set the scene and tone as early as possible, and a brilliant way in which you can do this is to have a wedding invitation that matches your colour and mood perfectly. 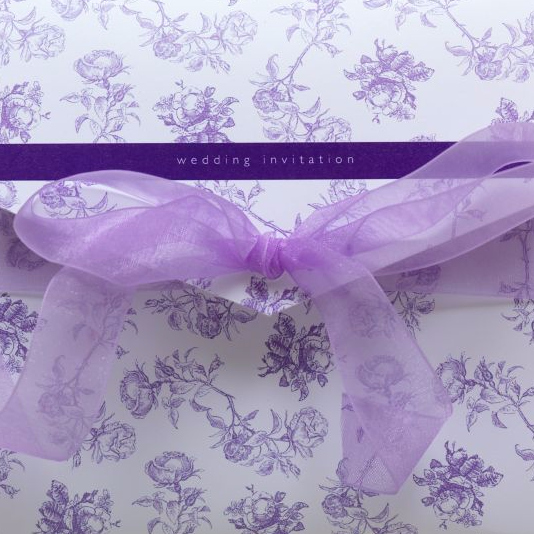 The Bella wedding invitation from Bride & Groom Direct has a purple design and is perfect for any wedding that has a splash of purple attached to it. Purple is a vibrant colour that lends itself perfectly to being a main colour of the wedding or as a colour that complements the main theme very well. The right colour is a great starting point for an invitation, but the design has to match the colour in elegance and class. This is an area where the Bella wedding invitation doesn’t have any problems. This is a wedding stationery package that has been compiled to perfection. The chiffon ribbon adds the ideal finishing touch but the floral pattern is elegant and classy, helping you to create the right tone from the very start. The border of the invitation works well with the colour scheme and design and there is an opportunity to personalise the invitation and reply card. For wedding themes that are a little bit different but which still have a traditional style, the purple version of the Bella wedding invitation is going to turn heads and please your guests with a minimum of fuss and effort.